Shirdi Sai Baba Stories,Leelas and Teachings. : Ask and it shall be granted-Experience by Sai devotee Aarti Khanna. Ask and it shall be granted-Experience by Sai devotee Aarti Khanna. Forwarded below is Sai leela experienced in Shirdi by Sai devotee -Aarti sister,few days back she had taken prayer request for all the Sai children to Shirdi Sainath .Please read the attached mail below. Jai Sai Ram . Can you please post this experience of mine with the picture attached. Although, I wanted to send this in morning so that it reaches to the devotees today itself on Baba's day but I am little late.. I want to share one of my experiences I had when I was in Shirdi. A week before when we were supposed to leave Shirdi I had downloaded a beautiful wallpaper which was all in golden. 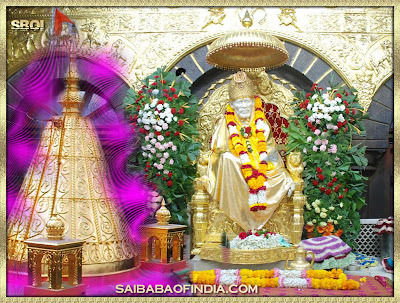 I mean it had a golden temple of smadhi mandir, Sai is wearing a golden dress sitting in his golden throne with awesome flower decoration on both sides. When I was shopping in Shirdi I thought of buying that same picture. After searching few shops I could find exactly the same picture in a Silver frame. Silver frame was not appealing as the picture had all gold tone and silver was a kind of mismatch so I asked the shopkeeper if he had that same picture in a different color frame preferably golden. He searched and gave me a dark brown frame which was also not the best choice but of course better than Silver. Although I wanted to buy that picture in Golden frame and asked him that if by any chance he has it in golden color. To this he said that it is available in two frames only (i.e silver & dark brown). Though I am little choosy in picking things but I knew that it is very difficult to get exactly what one longs for. So I finally decided to buy it in dark brown frame. When I was paying for the same my cousin came from behind and expressed her desire to buy the same picture. Though I was feeling bad that after lot of discussions on the frames and wasting lot of time I could not buy what I had thought of but I was OK with it. The Shopkeeper was a kind fellow and he was feeling bad for me. Probably he had sensed that I wanted this picture badly as I didn’t care to look at so many other pictures he had in his shop. Just when we were about to leave the shop, the shopkeeper told us to wait,called another guy who was outside (the guy came from outside and the discussion about the frames was not known to him) and told him to quickly go and check in the stores if the same picture is available and told him to bring it if its available in Dark brown frame. That guy came after few minutes and said “Vo picture dark brown frame mein toh nahi mili, Golden frame mein mili hai..yeh leni hai toh bolo”(Could’t find that picture in Dark brown frame, its available in Golden frame, tell me if u want this one ) . The shopkeeper smiled at me and said “Baba toh aapke saath hi rehta hai, sunta hai jo kehtae ho” (Baba is with you only and listens to what you say”). I was wonder struck and had goose bumps . “Ask and it shall be granted”. The unique way of showing his presence and taking care of even the minor wishes (picture in exactly the same golden frame as I had thought of) of his devotees leave us spell-bound.